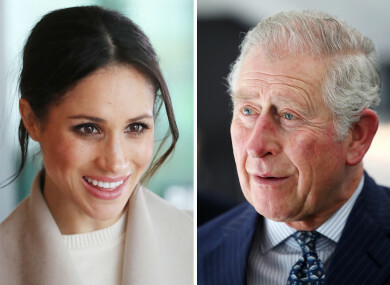 PRINCE CHARLES WILL walk Meghan Markle down the aisle during her marriage to his son Prince Harry tomorrow, Kensington Palace has announced. “Ms Meghan Markle has asked His Royal Highness The Prince of Wales to accompany her down the aisle… on her wedding day,” said a palace statement. The announcement follows the confirmation that Thomas Markle will not be taking part in the ceremony. Earlier this week, it was reported that Thomas Markle had suffered a heart attack. The news came after it was reported he had posed for paparazzi photos in the UK. The images, showing him being measured for a suit and admiring a photo of the future royal couple on his computer, sold for $100,000 (€83,000) according to tabloid the Daily Mirror. Meghan Markle’s mother, Doria Ragland, is divorced from her father, a retired Hollywood lighting director. Markle said that she has always cared for her father and hopes he can be given “the space he needs to focus on his health”. Email “Prince Charles to walk Meghan Markle down the aisle”. Feedback on “Prince Charles to walk Meghan Markle down the aisle”.